The easiest website design program available. Quickly and effortlessly create professional looking websites without having to know any HTML or coding. SiteSpinner is a completely visual, drag-and-drop website creation tool. Click, place and move any object in the SiteSpinner work-window using your mouse, and position it on the page exactly where you want it. SiteSpinner truly is 100 percent WYSIWYG - What You See I What You Get. Search Engine Friendly Websites. SiteSpinner is one of the few visual website creation tools to produce industry-standards compliant HTML websites. The sophisticated HTML web pages created by SiteSpinner ensures that your web pages are easily indexed by all major Search Engines. What is more, SiteSpinner includes professional Search Engine Optimization software to ensure your site gets top rankings. One-click publishing. Once you have designed your new website, SiteSpinner takes the frustration out of publishing it to the web. Uploading is made easy - simply click the Publish function and the SiteSpinner Publisher takes care of uploading all your pages and images to your web-host and ensures that all your links are working. What's more, if you do not already have a web host, SiteSpinner has partnered with industry leading web hosting provider Bluehost to provide unlimited web-hosting at discounted pricing. Incredibly Easy to Use - SiteSpinner makes it simple for anyone to design and publish professional looking websites quickly and easily. Truly uncomplicated drag-and-drop design lets you position text, graphics, Foreign Objects such as Flash files, exactly where you want them. The 'Everything You Need Website Design Suite' - SiteSpinner is an all-in-one website creation package - easy enough for beginners, but with powerful features that you can grow into. SiteSpinner's advanced graphical work-window enables precision drag-and-drop layout, including the ability to easily 'center' a website with the click of a button. With the built-in word processor and spell-checker, integrated image editing and graphics creation capabilities it's easy to build professional looking websites without having to know any HTML. Industry Standards Compliant, Search Engine Optimized Web Pages - SiteSpinner's advanced functions enable you to create customer feedback Forms, Frames, Special Effects such mouse-over effects, drop-down navigation menus and more. Don't want to start from scratch? SiteSpinner comes with a number of quality Templates to help you get started quickly. Once your site is done, the built-in Publisher uploads your website with a single click - your files are automatically published to your web-host. Web-Hosting - Publish to any web host you want. Already have a web host? Great! SiteSpinner can publish to it. And if you need a web host to publish to, SiteSpinner has partnered with industry-leading Bluehost to offer unlimited web-hosting at deeply discounted pricing. Customer Support is always here when you need it - we do not disappear. Our Community Forums are an active and lively mix of new users and Gurus with many years' experience and who are always willing to help out. 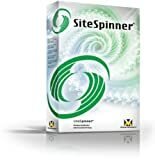 SiteSpinner comes with advanced Tutorials, Online Help and a printable PDF manual. SiteSpinner also comes with unlimited, direct online support. Feeling overwhelmed by all the digital marketing tips and growth hacking tactics that are out there? Searching for the right solution that will help you grow your business? Well, you’re in the right place because now you can solve your business problems in the best possible way! Not only will you be able to grow your business, but you can have a list of different tactics that will help you keep growing your business day by day, week by week and year by year! At different points in a digital marketing career, you’ll take on big lofty goals, whether you're marketing a small, medium-sized, or large corporation. It’s hard to know what to do or even where to start. Figuring this all out from scratch is also so time-consuming! There’re so many digital marketing blogs, growth hacking videos, and websites out there that teach specific marketing tactics. The problem is you still don’t know which one is the right choice for you! These postcards have all the marketing tips that will help you out. Not only will you get great advice, but these cards also teach you how to implement them and apply it your business right away! Don’t worry - Flowjo is here to help you. Flowjo was born to bring together tested, tried and proven growth hacks that will bring traffic to your website, convert them into leads and sales, and keep customers coming back again and again. Whether you have a business that’s never used digital marketing in the past, have a new business, or even thinking about starting a small business or startup, this growth hacking box will break everything down, step by step. It will help you figure out how to brainstorm new digital marketing ideas for your business, acquire new leads, convert them into customers, retain them, get your customers to advocate for you and ultimately cash in. The best part? It lives on your desk so that you can take a much-needed break from your laptop. Easily update, add, and publish content to existing websites in minutes - without knowing HTML. Non-technical users can make changes while Contribute3 automatically maintains existing website style, layout, and code. Symantec’s Norton Internet Security 2005 AntiSpyware Edition provides essential protection from viruses, hackers, and privacy threats. This easy-to-use, integrated product includes virus protection, spyware removal, a firewall, intrusion prevention, privacy protection, spam detection, and content filtering. This edition includes powerful new Norton Spyware Protection (available for Windows 2000 and Windows XP only), which automatically detects and removes both spyware and adware. Norton Spyware Protection even helps you identify adware that’s needed to run programs you want. Norton AntiVirus is the world’s most trusted antivirus solution. Its Norton Internet Worm Protection blocks worms from entering your computer through direct Internet connections. And QuickScan allows you to run a fast, efficient virus and spyware check at any time. Norton Personal Firewall keeps personal data in and hackers out. Norton Privacy Control prevents personal information from being sent out without your knowledge. Norton AntiSpam filters out unwanted email. To defend against email fraud, it even finds deceptive Web site addresses within messages. And Norton Parental Control helps you safeguard children from inappropriate content by blocking access to specified Web sites and newsgroups. Defend yourself, your family, and your PC online with the all-in-one protection of Norton Internet Security AntiSpyware Edition.